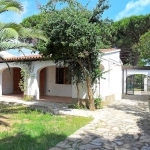 This is a four room house of 60 m2,1 km from the sea. Furthermore there is a kitchen and a shower/bidet/WC and a separate WC. The terrace is 8 m2 there is a washing machine available. The supermarket is 1 km away, sandy beach "Riells" 1 km.